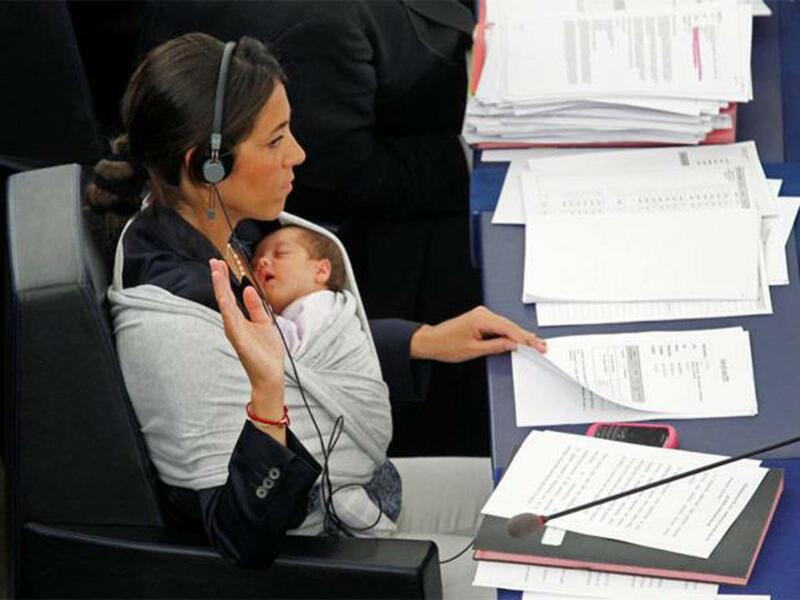 European Member of Parliament, Licia Ronzulli (an MEP from Italy), took her seven-week old daughter, Victoria, to work at the European Parliament in Strasbourg. [It was not a 'Take-Your-Child-to-Work' event.] She kept her baby carefully cradled against her in a wrap and occasionally leant to kiss her on the forehead. This photo was taken as she voted on proposals to improve women's employment rights and was broadcast and published in newspapers around the world. You might remember the first photos of Licia Ronzulli taking her daughter to work back in September of 2010. Mom's work was (and still is) representing Italy as a member of European Parliament in Strasbourg, France, and the photo of six-week-old Victoria sleeping in an elaborate snuggly while her mother cast her vote, brought a universal awwwwww as it made its way around the world. There was so much to love about the series of photos. The adorable dreaming infant, the elegant (if somewhat sleepy-looking) working mother, the innocence of the baby against the backdrop of men in suits -- men who had to be getting the message. Well, little Victoria is now a toddler, her mother took her to work again this week, and there are more photos. These show the 18-month-old wide-awake on Ronzulli's lap (it should be said that Ronzulli also looks more awake.) The little girl plays with her mother's translation headphones, and her cell phone. Victoria rises alongside Mom when she stands to speak, then raises her hand in tandem to cast a vote. If you cooed at the last photos, there is even more to love about these. One can imagine the conversation that led to them -- the sitter was sick, or Victoria's father was called out of town, or daycare closed unexpectedly, and Ronzulli did what a mother does and made it work. And what a message for a little girl: that her mother is her mother; but she also makes laws and things; and isn't that fun?